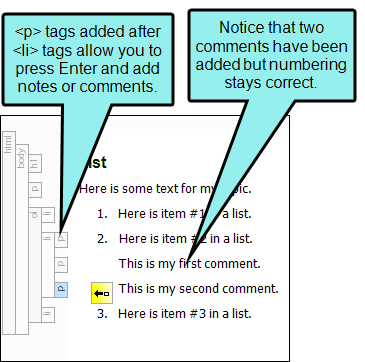 After creating a simple or multi-level list, you may want to include comments between items without interrupting the flow of the list. You can do this by using paragraph items in a list. Here is a typical list with the tag bars shown to the left of the content. Notice that the entire list has an <ol> tag, and each line in the list has an <li> tag. Each time you press Enter after a line, a new <li> tag is created. Let's say that we want to add two comments after #2. By turning #2 into a paragraph item, a <p> tag is added after the <li> tag in that line, and in each line that you create immediately after that line. The paragraph item icon is displayed at the beginning of the final paragraph item in that <li> tag. If you click this icon, that line becomes a new list item with its own <li> tag and a number (or bullet, if used) is displayed before it. For example, if we were to click the item in the previous image, the resulting list would look as follows. Click in the list where you want to add a paragraph item. Ribbon Select the Home ribbon. 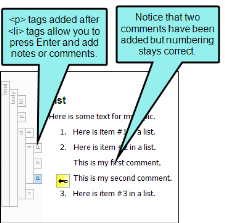 In the Paragraph section click the down arrow next to the List Actions button . Keyboard Shortcut On your keyboard hold down the CTRL key and press the semicolon key (CTRL+;). Right-Click If the tag block bars are not shown to the left of the content, click at the bottom of the editor. Right-click on the li tag bar that is next to the item where you want to add a paragraph item. If you used any method except the keyboard shortcut, select Make Paragraph Item(s). A <p> tag is added after the <li> tag. To add lines without a number or bullet, simply press Enter on your keyboard and type your content. To continue the numbering or the bullets, click the paragraph item icon . Doing this simply starts another <li> tag. 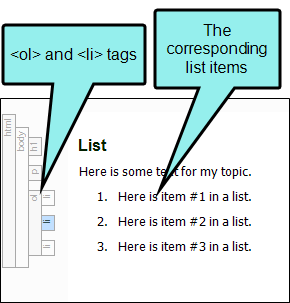 Click in the list where a paragraph item exists (an <li> tag followed by a <p> tag). Right-Click If the tag block bars are not shown to the left of the content, click at the bottom of the editor. 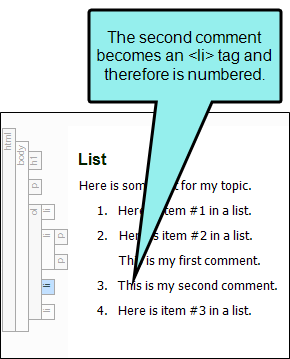 Right-click on the li tag bar that is next to a line where a paragraph item exists (an <li> tag followed by a <p> tag). Select Make Simple Item(s). The <p> tag is removed.